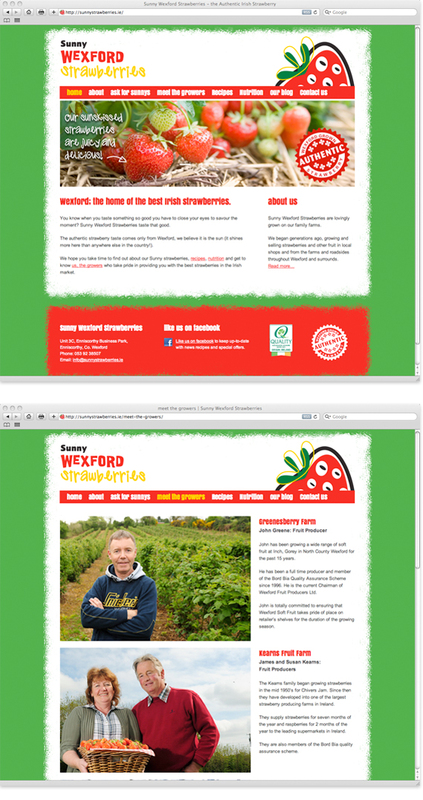 “Curious Design worked with us on the Sunny Wexford Strawberries website. As a brand, Sunny Wexford Strawberries is the first of its kind in the Irish market and as such it was important to get the look and feel just right. Curious translated our brief perfectly. Working as an extended Pivotal team Curious were proactive, creative and on time. We were delighted with the website, our clients were thrilled and most importantly it is getting lovely reviews through our social media links. Sunny Wexford Strawberries are Ireland’s first branded strawberries. The farmers behind Sunnys are campaigning to get their Wexford strawberries onto supermarket shelves around the country. Working with PR agency Pivotal Communications we designed and built the new Sunny Wexford Strawberries website. Built in WordPress the site is easy to update and maintain, and features a blog, recipes, information about the strawberries and their growers and gives users the opportunity to request that their local store stocks the brand.